The British Airways Visa Signature card currently has an Informr score of 8.2 out of 10. This score is based on our evaluation of 16 sources including reviews from users and the web's most trusted critics. 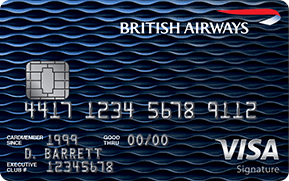 British Airways Visa Signature card is typically available to those with excellent credit scores (650 or greater). Although the British Airways Visa Signature card offers an eye-catching signup bonus, it requires you to spend a significant amount of money to qualify. For those looking to spend, this card rewards just that, but the more modest consumer may want to look elsewhere for an easier travel aid. The British Airways credit card from Chase has a compelling welcome bonus offer, especially if you hit the large spend bonus. It’s earning structure and card perks are a little lacking though. If you fly often with British Airways and their Alliance or oneworld partners, the options to redeem your Avios are varied and you can easily use every single one of them. If you love flying on airlines in the oneworld alliance — especially British Airways — the British Airways Visa Signature Card could be the card for you. Because of the card’s redemption program, you can easily use every last Avios you earn. And with that big sign-up bonus, it’s easy to start saving up for your next adventure. The British Airways Visa Signature® Card is a great choice for those looking for a large signup bonus and for those who frequently travel on British Airways, Iberia Airlines, or OpenSkies flights. The British Airways Visa Signature card from Chase is a great credit card for any traveler, even if you don’t often fly with British Airways. It’s also the sole credit card geared toward U.S. consumers that earns British Airways Avios. Relatively easy to be approved for (if you have excellent credit), has a generous sign-up bonus, and comes with some perks that more than justify the annual fee. Outside of high rewards on airline ticket purchases, this card gives all users the opportunity to earn a Travel Together Ticket, which is one of the most high-valued credit card rewards available. It’s truly designed for the ardent British Airways flier, as they will get the maximum rewards for their purchases through the airline.